Plymouth Discovery Tours will be adding an extra 10am bus service, collecting from the Mayflower Steps on the Barbican, to take visitors to the Good Food Market at Royal William Yard. Market-goers will also be able to hop on their usual tour of Plymouth service, at The Barbican and Royal William Yard and travel with the tour to alight at Royal William Yard during the day. Lorna Pearce, of Plymouth Discovery Tours, said: "We are delighted to be able to offer this extra service and get involved in the Royal William Yard community in this way. The Royal William Yard Good Food market showcases local food and drink from all over the South West. The market takes place between 10am and 3pm on The Green, Royal William Yard, on the first Sunday of the month. Beryl the Bus will collect passengers from the Mayflower steps at 10am, 11am, 12.10pm and 2pm. Return journeys to Royal Parade and the Barbican will be at 10.25am, 11.25am, 12.35pm and 2.25pm from opposite the clock tower inside the Yard. 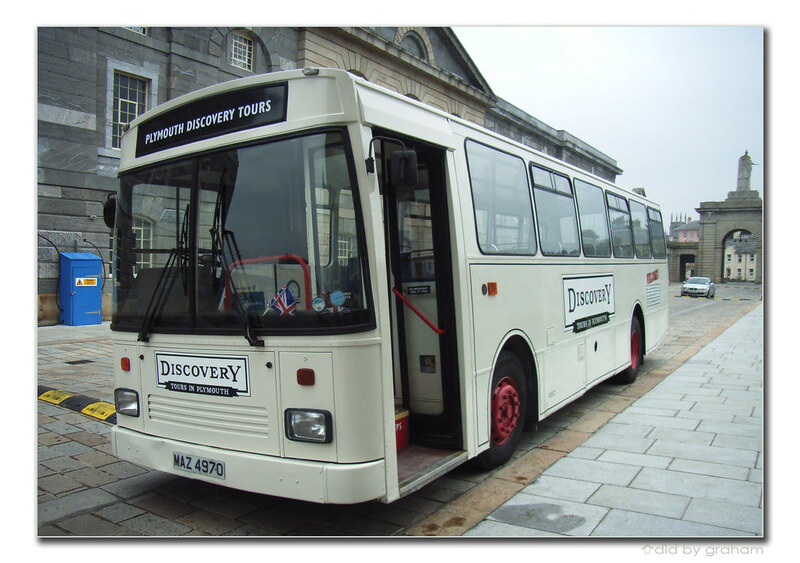 Its amazing to think that it was over four years ago that Plymouth Discovery Tours was launched. We went to the launch Party at The Royal William Yard way back on the 18th April 2008. There were a few sceptical voices at the time that the new venture would last long, and quite a few wondering if an elderly Leyland Leopard bus was a wise choice - would they be able to keep a bus like that on the road. Well it seems that the answer to that was yes! In a city dominated, like so many others, by Dennis Darts it is always a treat to hear the throaty sounds of the Leopard!